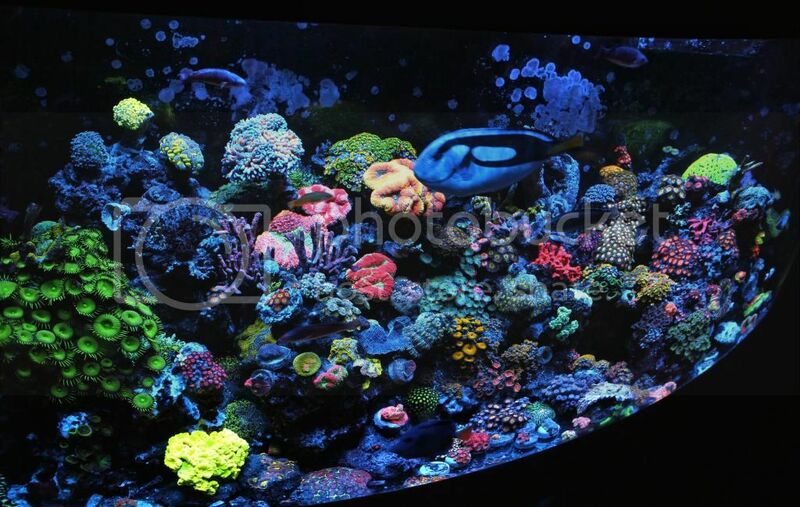 Richard (Siptang)'s 72g Bowfront Giant Frag Tank Aquarium. Why is it a giant frag tank? I get this question a lot. My tank is a tank of average Joes. 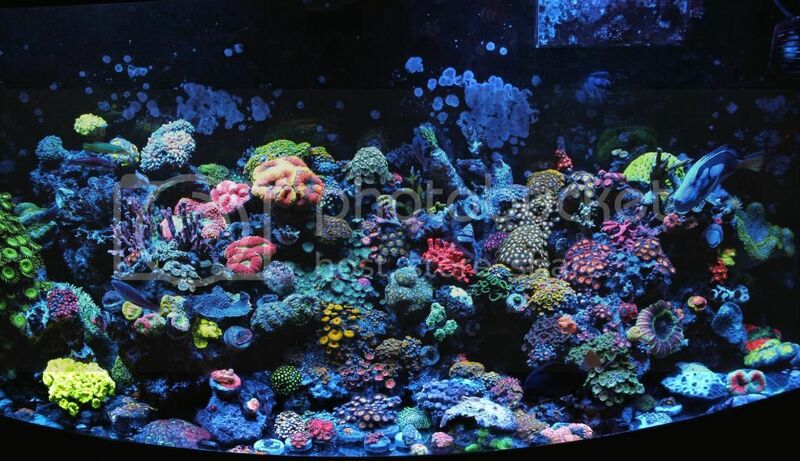 90% or more corals were bought as frag and raised from single polyp or from 0.5 to 1 inch nubs. You will still see frag plugs and shapes of frag plugs and discs everywhere. I have not spent more then $35 on any coral in my tank and got this collection on purely on trades with fellow hobbyists and on a good growth taking over my tank. My tank is to show everyone and anyone that if done smart and with patience, anyone can have a nice reef setup without breaking the bank. I have kept fish from very early age. Starting out from fresh water to help out my grandmother to first stepping into the world of reef tank during college sophomore year in 2002. I have stepped away from reef tanks and kept strictly fish only system for 4-5 years until I tragically lost my toddler son to SUDS. Losing my mind, I dove into a world that I told myself that I will never get into. World of Reef Tanks. This tank is a legacy and a gift to my son. Tank is 72g bowfront tank. It is plumbed into a custom made 20g Berlin style sump with 10g frag tank on the side. It is illuminated by 2 Rapid LED Onyx dimmable fixtures controlled by Blue Fish Controller. For filtration, I use Reef Octopus NWB 110, Two Little Fish 550 for GFO and 150 for carbon. Jebao DC 12000 will be used as main pump and will be hard plumbed using PVC manifold and valves to control all the water circulation from top to bottom. UV 18w and Ozone will be used sparingly to polish water from any type of parasites or bad free floating algaes. My routine is pretty locked down. I use Aqua Craft's Bio Sea salt mainly and if it's being maintained by someone else, Red Sea Coral Plus salt is used.